The Boston Marathon is a famous marathon which is run every April in Boston, Massachusetts on Patriot's Day. The distance of the race is 26.2 miles or 26 miles and 385 yards. To participate, runners need to qualify ahead of time by getting a certain time on another marathon first. This time is different depending on how old the runner is. (Every year, some runners who do not qualify are allowed in by raising money for charity). During the 2013 Boston Marathon on April 15, 2013, two explosions happened near the finish line at 2:49 PM EDT. Three people were killed and around 183 people were injured. 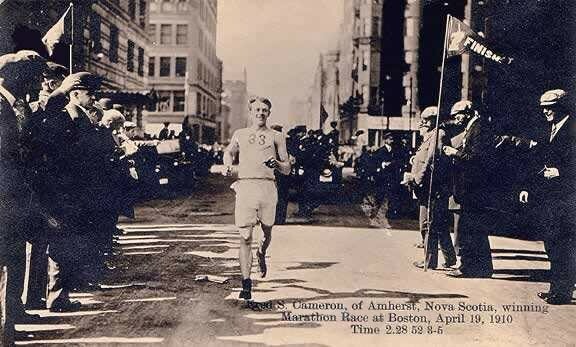 Boston Marathon Finish Line, 1910. Robert Kipkoech Cheruiyot in the 2006 Boston Marathon, where he set a new course record. Boston Marathon Facts for Kids. Kiddle Encyclopedia.